Little pop quiz here. What movie comes to mind if I say, is butter a carb or she doesn't even go here? Or there's this classic. LACEY CHABERT: (As Gretchen Wieners) That is so fetch. RACHEL MCADAMS: (As Regina George) Gretchen, stop trying to make fetch happen. It's not going to happen. GREENE: If you guessed "Mean Girls," you'd be right. The movie was so influential that screenwriter Tina Fey and producer Lorne Michaels figured, why not a musical? Fifteen years later, it is happening on Broadway. NPR's Elizabeth Blair wondered whether a story about backstabbing teen girls holds up in this age of female empowerment. ELIZABETH BLAIR, BYLINE: Cliques in the cafeteria, eye rolls, betrayal and self-loathing. It's all in there in "Mean Girls." And beware the girl in pink. UNIDENTIFIED ACTRESS #1: (As character, singing) Don't be fooled by the pink. She is not playing dolls. She is stalking the halls for the thrill of the kill. BLAIR: If you're not familiar with "Mean Girls," quick backstory. In the early 2000s, Tina Fey read Rosalind Wiseman's nonfiction book "Queen Bees And Wannabes" about the drama of teenage girls and their often dysfunctional friendships. Fey was struck by the power some girls wield over others. TINA FEY: The thing that I was so drawn to was they were insidious in their intent but also so fascinatingly clever in the invisible ways that people would do things to each other that you had to kind of admire the intelligence and power of it. At the same time, it has to stop (laughter) kind of thing. It was, like, a book full of Bond villains. BLAIR: Villain number one in "Mean Girls" is Regina George, played by Taylor Louderman. She's the hot blonde everyone wants to impress, despite her evil streak. TAYLOR LOUDERMAN: (As Regina George, singing) This is performance. This is all self-defense. I thought you had the sense to see through that. BLAIR: Queen Bee Regina and her wannabes are a clique known as the plastics. Every Wednesday, they wear pink. Cady, played by Erika Henningsen, is the new girl and she wants in. She's also got a huge crush. ERIKA HENNINGSEN: (As Cady Heron, singing) Could that image be more hot? Let me just enjoy that thought. School was tough but now it's not 'cause now there's him. BLAIR: And then there's Janis, the revolutionary in the story, played by Barrett Wilbert Weed. She's an artist who's been hurt by her onetime friend Regina George, so she wants nothing to do with girls who wear pink. 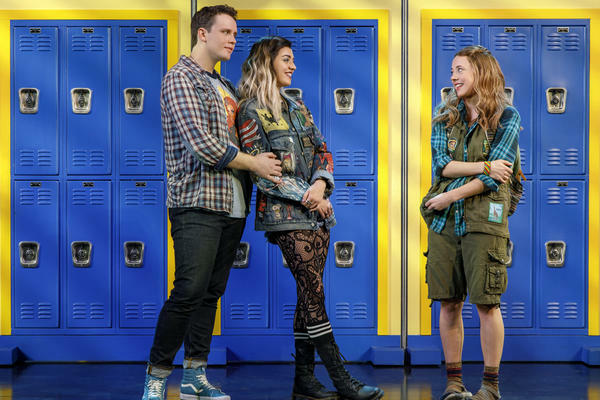 BARRETT WILBERT WEED: (As Janis Ian, singing) Say, no. Say, knock it off with your notes and your rules and your games and those sycophants who follow you. I'll remember all your names. BLAIR: Tina Fey says in high school, she was a little bit of each character. FEY: I was a good student, active in, you know, choir and editor of the newspaper and played, you know, one sport. You know, but at the same time, I was consumed with jealousy of people who I thought had a life better than what I had, you know. And I think that it is self-poisoning in that way. And I think I didn't really fully understand that and that my kind of poisonous sense of humor probably stressed out other people. I didn't understand that until I was about 30 years old. BLAIR: And Fey thinks that's one reason "Mean Girls" still holds up. Older women and teens see themselves playing out their worst behavior. UNIDENTIFIED ACTRESS #2: (As character, singing) She's the queen of beasts. She can smell your fear. In this biosphere, she's the apex predator. BLAIR: The music for "Mean Girls" was composed by Fey's husband, Jeff Richmond. He also had to get in touch with his inner teenage wannabe. He played sax in the marching band and still remembers a particular group of girls. JEFF RICHMOND: They were the cheerleaders, and they were powerful and mean. And you just kind of wanted to, boy, if I could just make them laugh at something I do, I think that's going to get me in. That'll be great. BLAIR: That is the fate times 10 of the character Gretchen, played by Ashley Park. She is desperate to please Regina George. ASHLEY PARK: (As Gretchen Wieners) Regina, let me in. I'm sorry about the car burp. BLAIR: That fragility is what lyricist Nell Benjamin thought about a lot while writing songs for "Mean Girls." NELL BENJAMIN: You are aware that things are not right with the relationship you're in, but you don't know how to fix it. BLAIR: In "Mean Girls," Gretchen sings "What's Wrong With Me." BENJAMIN: The song is just, you know, an exploration of, how do I make myself better? How do I make my friend like me? And the answer is, of course, if they don't like you, they're not your friend. But in high school, who knows that? BLAIR: Tina Fey says the song captures the female experience. I interviewed Fey and Richmond together. She turned to him to give him credit. FEY: And the thing that I loved about the way you guys did it is Nell - you and Nell talked about it being a love song, not unlike "It Had To Be You." You know, if you listen to "It Had To Be You," it's about a terrible relationship. HARRY CONNICK JR.: (Singing) Or even be glad just to be sad thinking of you. FEY: You know, I'm not happy with you but it had to be you. And so those early friendships, when they break up, are devastating. Gretchen's verse is tell me what's wrong with me, my body, face, my hair. PARK: (As Gretchen Wieners, singing) My body, face, my hair. FEY: Tell me all my many faults. Tell me like you care. (Singing) When we both know you're cruel and we both know you're right. PARK: (As Gretchen Wieners, singing) When we both know you're cruel and we both know you're right. FEY: (Singing) I could listen to you like a fool all night. PARK: (As Gretchen Wieners, singing) I could listen to you like a fool all night. What's wrong with me? How I speak? How I dress? What's wrong with me? FEY: It's Gretchen singing literally outside a locked door to Regina, the person that she just wants approval from that she'll never get. PARK: (As Gretchen Wieners, singing) Now I'm listening to you. What do I do that for? Please don't ignore me. BLAIR: The world has changed so much since the movie "Mean Girls" was released 14 years ago. In the movie, only one girl had a device, and it was a flip phone. The musical has made adjustments. 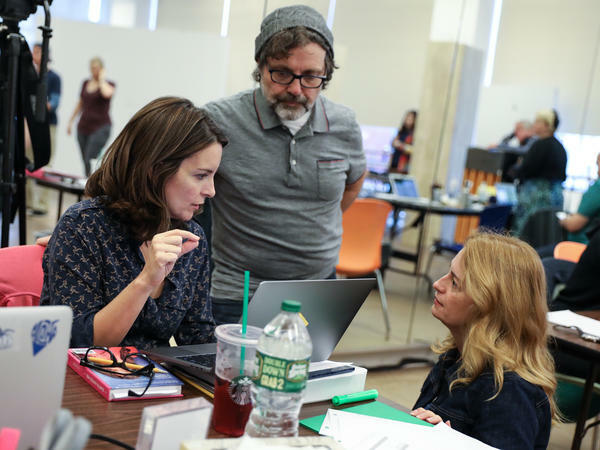 Tina Fey says social media does make a difference in girls' lives. FEY: It's sort of like the difference between the Civil War and a modern-day war where the battle is still drawn but the weapons are just so much stronger and more devastating, right? ROSALIND WISEMAN: Girls are still really focused on pleasing each other. BLAIR: Rosalind Wiseman, who wrote "Queen Bees And Wannabes," says girls will forever struggle with their friendships. WISEMAN: The legacy of those issues really follows girls into their adulthood, in their work, in their relationships. And I think a lot of women can relate to it. And that's why so many people related to "Mean Girls." BLAIR: Tina Fey has been working on the musical version for the past five years, so before the Me Too movement really took off. But she still thinks women are too easily dismissed. FEY: As great as things are going, you still have sometimes people going, like, I don't believe her or, like, I don't like the way she did it and she should have spoken up sooner. And, like, we're still finding a way to blame other women for the actions of men, right? So there's still a little work to be done. BLAIR: Tina Fey definitely doesn't want to hit people over the head with these ideas in "Mean Girls" the musical. But she hopes mothers and daughters will see the show together. It'll give them plenty to talk about afterwards. Elizabeth Blair, NPR News. Transcript provided by NPR, Copyright NPR.